Good multi with a good flavor. My children actually now ask to take their multi-vitamin. Children need a sound nutritional basis upon which to grow and develop‚ so it’s important to ensure that they eat a balanced diet. However‚ with busy schedules‚ and fast or preprocessed foods‚ children may not meet all of their recommended daily value of nutrients each day. A daily multi-nutrient supplement can help provide the nutrition they need to grow up strong and healthy. 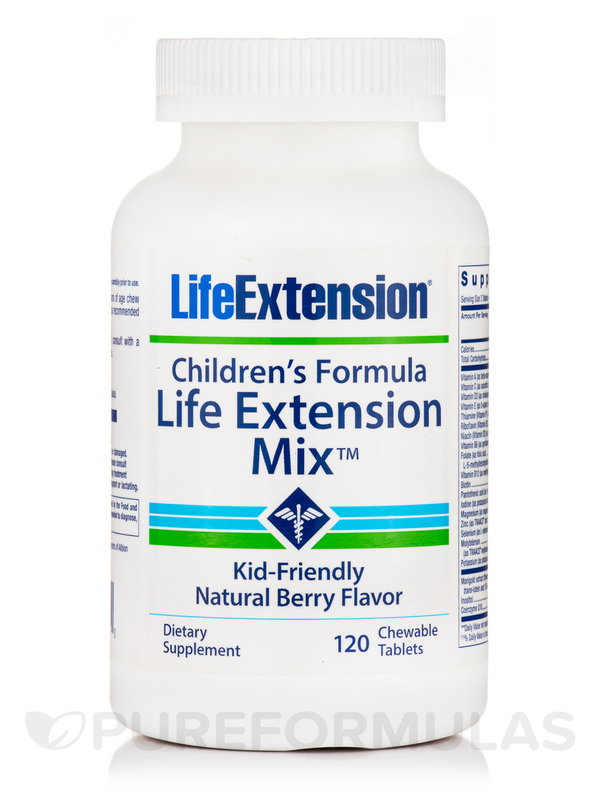 The Children’s Formula Life Extension Mix™ contains ingredients from Life Extension Mix™ in amounts that are suitable for children four years and older. Each easy-to-chew tablet contains ten essential minerals and vitamins‚ including A‚ D and C — important for a child’s healthy development and growth. Any supplement is only as good as a child’s willingness to take it. Parents know that children can be finicky about the taste no matter how nutritious. Children’s Mix has been reformulated for a more appealing berry flavor. We have also removed a select few nutrients that were interfering with a great-tasting product. Food supplements containing a mix of vitamins‚ minerals‚ phytonutrients‚ amino acids‚ essential fatty acids‚ phospholipids‚ and probiotics have been shown to help with childhood attention and self-control problems. †Percent Daily Value is based on a 1‚000 Calorie diet. ††Percent Daily Value is based on a 2‚000 Calorie diet. (1)Children 1-3 Years of age. (2)Children Over 4 Years of age. Other Ingredients: Xylitol‚ microcrystalline cellulose‚ natural beet color‚ natural (cherry‚ vanilla‚ strawberry) flavors‚ stearic acid‚ citric acid‚ gum arabic‚ silica‚ dicalcium phosphate‚ luo han guo extract‚ hydroxypropyl methylcellulose‚ maltodextrin‚ corn starch‚ stevia extract. For children 4-8 years of age chew two (2) tablets daily with food‚ or as recommended by a healthcare practitioner. For children under the age of 4 consult with a healthcare practitioner before use. My pediatrician recommended this vitamin and my daughter actually will ask every morning for her vitamins. She gets upset if we run out!